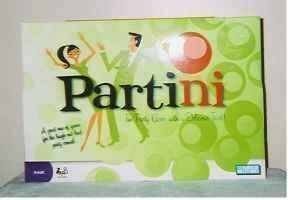 Partini is the Adult Party Game with a delicious twist. Open up the game box, sprinkle friends around the room, mix up the coasters, and then pick 'em at random to play 6 games. Six games include "Straight Up", "Mime Twist", "Bouncers", "What Not", "Clay Smoothie" and "Hum Punch". Contents: 35 coasters, 430 cards, 5 plastic cups, 2 plastic balls, container of Partini modeling compound, 2 pads of paper, 4 pencils, timer die and rules. Ages 18+. New in unopened case.